I just wanted to share something I picked up in my local convenience store recently – super yum orange peel flavoured Kit Kat bites. Nom nom nom! I’m not entirely sure why they are orange peel rather than being simply orange flavoured, but there was a hint of bitterness, and it is オトナの甘さ (a sweetness geared towards adults), so that might be why. Either way these are gorgeous! I love chocolate orange almost as much as I love mint chocolate after all, and I find that the Kit Kat Big リトル (Big Little) is a little more fun, or at least a nice change from the regular two finger variety. I hope you are having a beautiful week dear readers! Mwah! 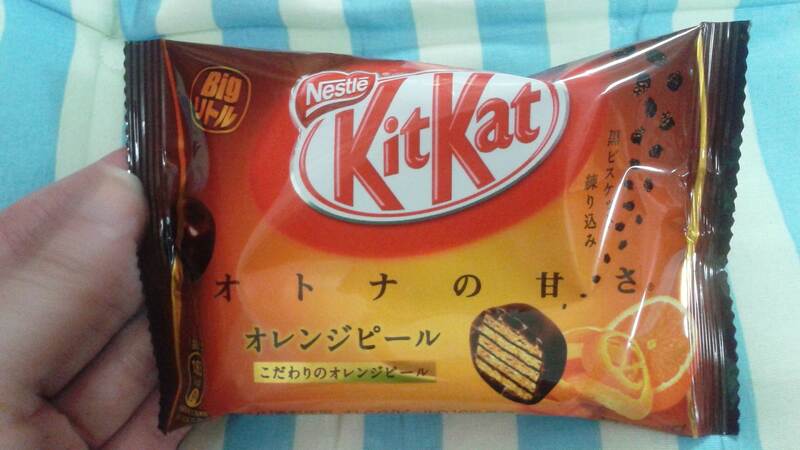 Did you see the creme caramel flavoured mini kitkats? They were amazing. Just got back from London. On certain days it really was as hot as it is here! Japan has ‘sweetness geared towards adults’ ?! I’ve never heard of that flavor. I’m partial to the sakura matcha flavor, but these sound copacetic too. Can you get a lot of the Japanese Kit-Kats in England? You might be able to find them in specialty Asian supermarkets, or perhaps the Japan Centre.